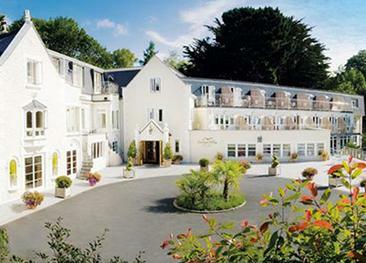 St. Pierre Park Hotel is located a mile from St. Peter Port and is set in 36 acres of rolling woodlands and gardens, complete with a lake, a 9 hole golf course and three tennis courts. 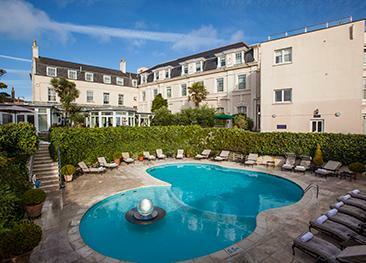 The hotel is Guernsey‘s largest resort with fantastic leisure facilities including a Health Club, Spa & Hair Salon, children play area and crazy golf. St. Pierre Park has a local reputation for delivering consistent and high-quality dining. There is a selection of Classic double/twin, Executive and Family rooms, Deluxe suite, Deluxe Garden Spa and Junior Garden Spa suites. All rooms are en-suite and equipped with complimentary toiletries, large flat screen TV, tea & coffee facilities, desk / dressing table, and free WiFi. Junior Garden Spa suites are large rooms with a private garden featuring a hot tub and lake views. Deluxe suites are spacious and feature a separate kitchen and two balconies. The exclusive Deluxe Garden Spa Suite offers a highly luxurious space complete with private garden and outside tub. All suites feature Nespresso machine, iPod docking station, mini-bar, ironing facilities, bathrobe and slippers, DVD, spacious bathroom with separate shower and complimentary toiletries, large flat screen TV, desk / dressing table, and free WiFi. Opens daily from 11.30am to 9 pm for lunch and dinner. The restaurant has been awarded 1 AA Rosette for excellence. The Terrace a great place to catch up on the world news, have a coffee and admire the hotel’s grounds during the day, and relax with a drink (or two) in the evening. La Fontaine overlooks the St. Pierre Park’s lake and is where breakfast is laid out. Events can be organised in the hotel’s function rooms. Enjoy the 9 hole golf course designed by Tony Jacklin CBE, and set amongst the hotel’s beautiful woodlands. Or just practice on the driving range before browsing the club’s shop. Indulge in a choice of Elemis spa treatments, aromatherapy treatments and products, massages and beauty packages, all available at Le Mirage Spa and Hair Salon. Fully equipped gym with qualified instructors, indoor swimming pool, steam room and spa pool, sauna and relaxation room. The hotel has ramps at the entrance and is accessible by wheelchair in all public areas. There are no disabled rooms as such but rooms with walk-in shower can be booked. Great room and excellent service. One of the best hotels I have ever stayed in. Excellent hotel, lovely spa facilities. Friendly and helpful staff. Given false information from reception on more than one occasion, also maid left no towels on one day. Great location with friendly, helpful staff. Couple of things in the room need attention, loose tap, bad lighting but staff happy to receive feedback. 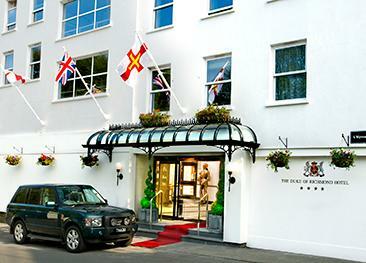 Fantastic hotel, great location, very comfortable, great food and most of all very friendly and helpful staff. We were given a very poor room to begin with but they upgraded us satisfactorily. Food disappointing. Cold toast and pooor coffee for breakfast. Dinner menu needs modernising. Really lovely hotel,clean,leisure facilities are good. The hotel was ideal for our needs. Spacious, friendly and caring, but non intrusive.